It seemed to resonate with many people and yet we all continue to do it. It started me thinking about how I could live more of my behind the scenes life in the open. 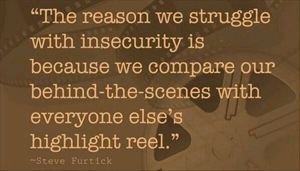 I don’t want people to think that they know me, or create a version of me from my highlight reel. Truth be told much more of my behind the scenes life can be seen on Twitter rather than Facebook. This is partly because of the nature of the sites and also personal choice. I have made attempts to be more open by sharing my blog posts on Facebook, something I never would have done a year ago. I also decided I needed to show more of my behind the scenes life day to day too. It’s scary and it makes you highly vulnerable but there is something really releasing in it. The realisation that there are people who accept you just as you are, exactly where you are. I experienced this on Friday firstly with friends from our antenatal class – It had been a tough night with little man and my energy levels were at an all time low which in turn affected my conversational ability and a I felt a wreck but I walked to our baby sensory class and was met with hugs and support. We then had lunch and I could just sit and be, nothing was expected of me. I then visited a friend, another mum, someone who doesn’t quite realise how brightly she shines in what can be a very grey world. Someone who despite feeling rough herself was happy to hang out ‘warts and all’ and who without knowing it reminds me who I am and can be every time I am around her. I truly live my behind the scenes life with her and it is when I am most alive. I lived unedited, unfiltered. I need to do it more and I think you do too. It scares me, it’s uncomfortable, it’s far easier just to hide. It becomes all consuming living a highlight reel. The desperation to post the beautiful photo, the clever status, to come across as the perfect mother, sister, wife, friend, worker, Christian. It’s tiring. It’s unsustainable. It’s a waste, a waste of us. ← I am not your enemy – why is motherhood a battle?